It is a sunny Thursday afternoon. “Go Eagles!” chants fill the air as cheerleaders practice cartwheels across the lawn of Benito Juarez Community Academy in Chicago’s Pilsen neighborhood. Nearby, students dash back and forth across a field during soccer practice. Michelle Sandoval, a 16-year-old junior, intently watches a co-ed football team practice drills. Class was over more than an hour ago, but the grounds are buzzing with student activity. Sandoval is a sports manager for the Juarez football team, the girls’ basketball team, and the girls’ softball team. “I want to be a doctor – a surgeon or a pediatrician,” Sandoval says with a confident smile, her long, dark brown hair lifted by the afternoon breeze. Her goal is to study medicine at Harvard University, and although neither of her parents attended college, she feels ready for the challenge. She already has a head start. She is taking a dual credit biology course, which allows her to earn high school and college credit simultaneously. It’s one of many opportunities at Benito Juarez Community Academy that she’s taken advantage of and that she hopes will help her achieve her dreams. Benito Juarez Community Academy, which serves a 94 percent Latino student body, opened in 1977. The walls are lined with murals that reflect Mexican culture and statues of Mexico’s historic leaders such as Benito Juarez, who rose from humble origins to become president of Mexico and a preeminent symbol of Mexican nationalism. The school also provides a hub for the local neighborhood and holds many community meetings, adult education classes, and open swim days for local families. 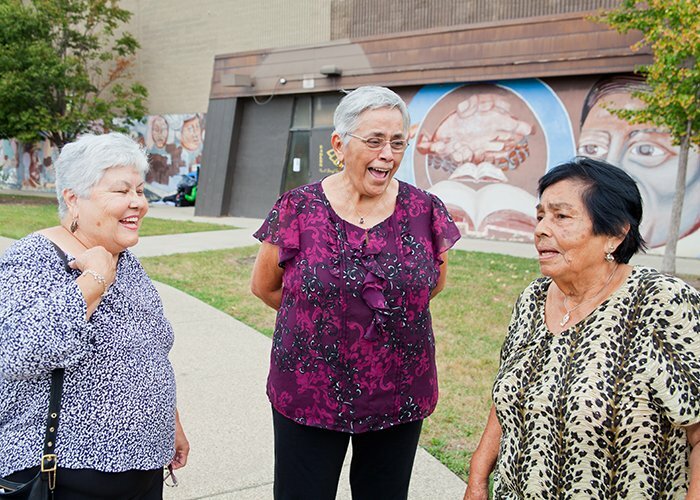 The school stands as a testament to community activists – most of them women – who fought against discrimination in schools and demanded the Chicago Board of Education create a bilingual public high school in their neighborhood. Raquel Guerrero was one of those women. The single mother of 9 children is now 83 years old. In the late 1960s, Guerrero had recently separated from her husband and was working multiple jobs. As her children became ready to enter high school, she faced a challenge she couldn’t solve on her own. She couldn’t afford tuition at the private high schools in Pilsen. But she didn’t want to send her kids to public school, which would have meant crossing gang lines to reach Harrison High School, a predominantly African-American public high school in the adjacent neighborhood of South Lawndale. Harrison High, like most Chicago Public Schools (CPS) at the time, lacked bilingual or bicultural education programs. Rather than provide assistance to Spanish-speaking students, the common practice was to place non-English speakers in classrooms designed for students with learning and behavioral problems. In 1968, tensions at Harrison High came to a head when African-American and Mexican-American students joined forces and organized historic walkouts. They demanded teachers and administrators who looked like them, curriculum changes to reflect their histories, and an end to discriminatory practices and behaviors. As documented in a 2010 study by Jaime Alanis, the walkouts started a movement. With the help of Pilsen Neighbors Community Council, parents, clergy, and activists started gathering inside Pilsen churches to discuss their educational concerns. Guerrero quickly joined the fight. “I was just a regular housewife and I didn’t have no experience in all this,” said Guerrero, who remembers often having a baby on her hip at meetings. Parents and activists agreed that fighting to make conditions better at Harrison was not enough. They needed a public high school in the neighborhood that would be safe for their children, meet the needs of recently arriving, Spanish-speaking students, and lower the high drop-out rates in their neighborhood. Their first step was gathering signatures on a petition demanding the construction of an entirely new high school. “A lot of people were part of the community effort,” says Guerrero. Some of the leaders included Inez Loredo, Carmen Ortiz, Lucy Gutierrez, Teresa Fraga, Rudy Lozano, and Mary Gonzales. Their request for a new high school was denied. Their request for a new high school was denied again. “I just remember the rage I felt internally,” says Gonzales. The organizing body realized signatures would not be enough. So they started organizing acts of civil disobedience. 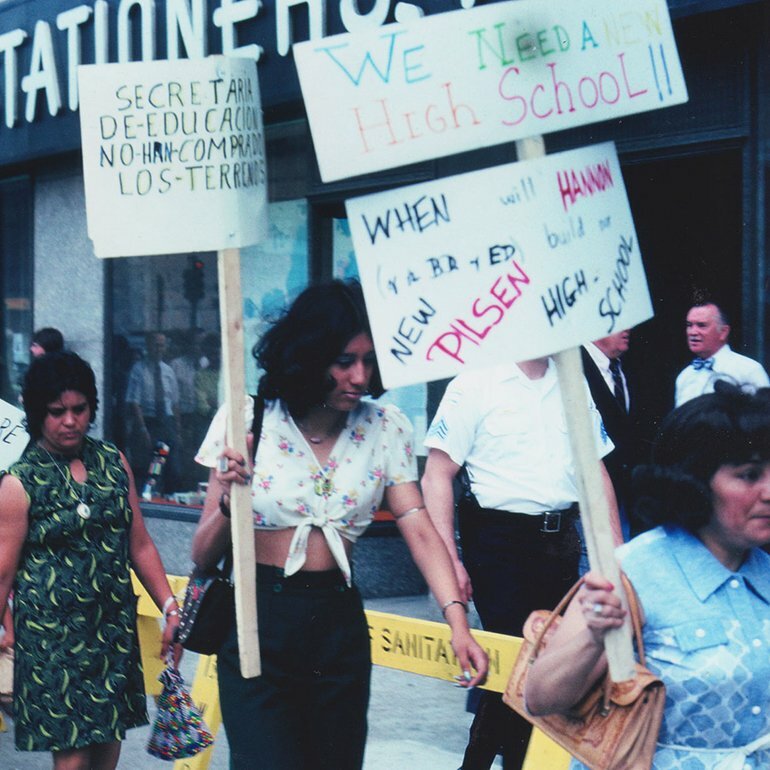 In June 1973, they participated in a boycott at Froebel High School in Pilsen, a branch of Harrison High where freshmen attended classes before transferring to Harrison their sophomore year. The boycott turned into a three-day occupation, with accompanying protests and rallies in support of the participants. In June 1974, Gonzales and Guerrero attended a Chicago Board of Education meeting with dozens of their neighbors filling the seats. The proposal for funds to build a new high school in Pilsen was on the agenda. Meanwhile, more activists marched from Pilsen to the Board of Education offices, then on LaSalle Street. By the time they made it downtown, the crowd had grown large enough to block traffic. That day, Chicago’s Board of Education approved $8.9 million in funding to build a high school in Pilsen. The success emboldened Pilsen activists and families. 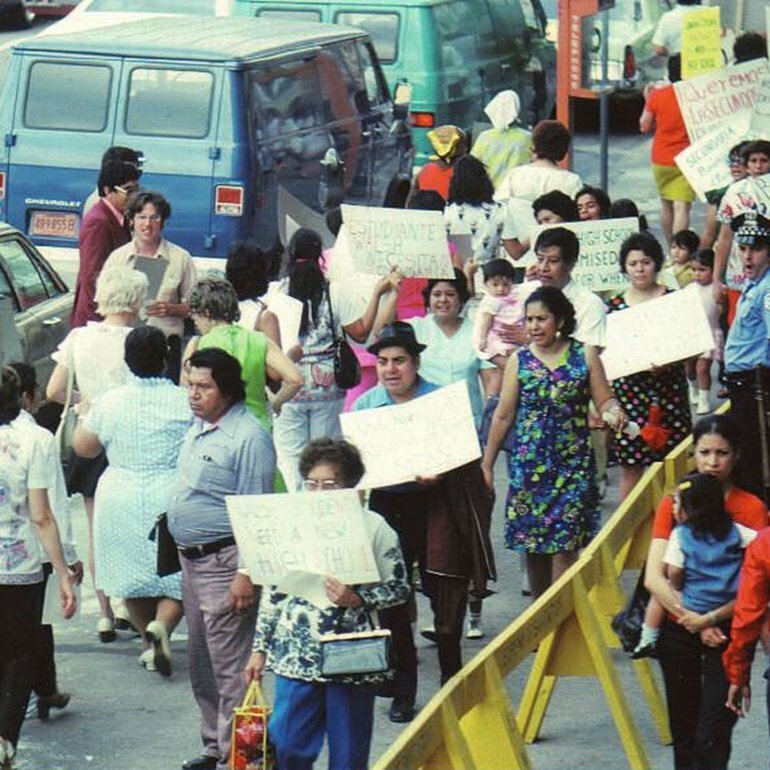 That same year Guadalupe Reyes, Gonzales’s mother, organized a street festival to celebrate the victory. 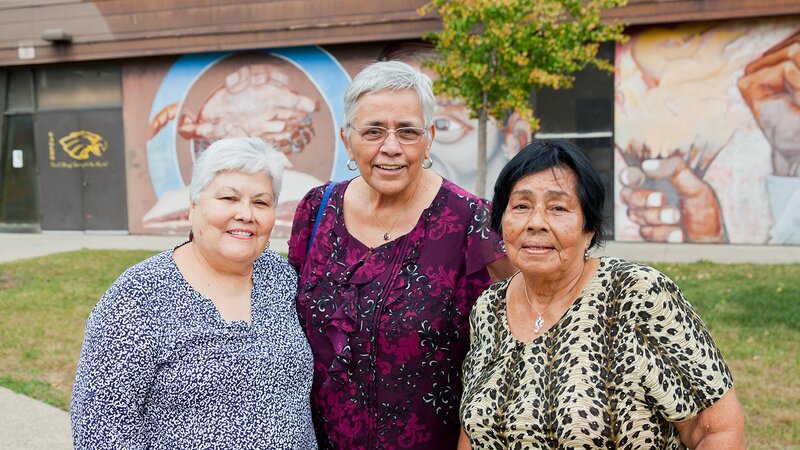 The festival has since become Fiesta del Sol, an annual celebration of the Mexican-American community in Pilsen. Benito Juarez Community Academy opened its doors on September 16, 1977. "The neighborhood took on an attitude that if we can do this, we can do anything." Today the school’s graduation rate is more than 80 percent. It offers programs in architecture, medicine, culinary arts, automotive repair, and internet technology. It also offers the International Baccalaureate program, a dual college credit program, and advanced placement classes. Of the 290 students that graduated from Juarez in 2016, 200 were admitted to four-year universities, says Juan Carlos Ocón, who is in his tenth year as principal of Benito Juarez. He says the school owes that success to the sacrifice of the mothers that fought for the school and continue to be involved in the community’s education. While Michelle Sandoval watches over the co-ed football team, she describes the assembly she attended earlier in the day in honor of National Hispanic Heritage month. The school’s nationally recognized mariachi band performed, along with folkloric dance teams from other schools. Sandoval’s favorite part was watching students model traditional clothing from different states in Mexico. For Sandoval, attending a Hispanic heritage assembly in the middle of her school day and managing a co-ed football team are normal. But for Guerrero, Gonzales, Fraga, and the many others who fought to ensure a place in Chicago for the next generation of Mexican-American students, every time another Benito Juarez student attends college and seizes opportunities they could never have imagined, there is much to celebrate. Guerrero herself stayed integrally a part of the Juarez community. She acted as a community representative until she retired in 2012. In the meantime, three of her daughters graduated with honors from the high school.